Captivating show | Daily Express Online, Sabah, Malaysia. 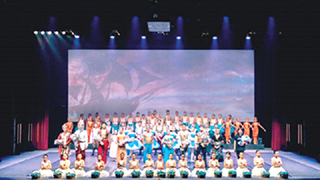 Kota Kinabalu: THE 100-minute spectacular full-length ballet production of Le Corsaire, a pirate's tale, kept the audience spellbound with dazzling costumes and a superb performance, emanating grace and pose, at the JKKN Auditorium, Kota Kinabalu, Friday night. With a 72-member cast (pic), including five principal dancers and professional ballerinas from Kuala Lumpur and two others from Ballet Manila Philippines, as well as 50 KK ballerinas, Le Corsaire is a fantasy tale of captive maidens and cutthroats, love and betrayal. Acts One and Two are based on an adventurous love story between a skilful pirate and an innocent and beautiful harem girl. It was part of this year's Annual Kota Kinabalu Arts Festival. Le Corsaire is an inaugural project of the IEC Heart for Arts Foundation in collaboration with City Ballet Performing Arts, Kuala Lumpur, under its Artistic Director Lu Wit-Chin. "The Foundation is the Corporate Social Responsibility (CSR) arm of IEC (a Centre for English Language and Further Studies Consultancy based in KK) to collaborate, produce and organise arts projects to benefit the local community," said its Executive Producer Jasmine Leong. The event was supported by the Society of Performing Arts Kota Kinabalu Sabah (SPArKS), and the Ministry of Tourism, Culture and Environment. At the end of the show, Jasmine thanked the appreciative audience, sponsors and media for their support.